A morning bike ride...a noon picnic...an afternoon baseball game...an early evening jog. Whatever your interests, our community parks offer a wide range of year round recreational opportunities. A short description of each park follows. Looking for an overview of facilities and amenities? We also have a chart which summarizes what’s available and where. This new park on Calais Road will feature a number of amenities including a community garden, a band shell, a paved and lighted walking path, pickle ball courts as well as restrooms and pavilions. View the Calais Road Community Park Rendering (3,418 KB) . Provides various recreation opportunities. 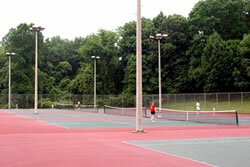 The facilities include six lighted tennis courts, four lighted softball fields, two lighted basketball courts, a tennis practice wall, a Skate Park, a 4-mile paved walking and jogging trail, and the Brundage Park Playhouse. A large playground and picnic pavilion are located in the heart of the complex and the pavilion may be reserved through the Parks and Recreation Department for groups of 50 or more. The Brundage Park Preserve, located just east of the main complex, has a lacrosse/soccer field and trails for walking and nature observation. The small pond is used for fishing and ice skating. 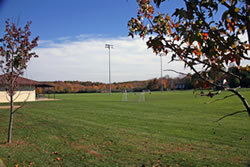 The southern section, Brundage Park at Sussex Turnpike, has a softball field and a large multi-purpose area for soccer and other field sports. The entrance to this area is located approximately 1/2 mile west of Calais Road on Sussex Turnpike. An extraordinary site once part of the Brundage family estate. This new park offers seven athletic fields including two used for football and lacrosse, one Little League and one Babe Ruth baseball field (all with lights). Other fields include a multi-purpose area and a softball field. The park also features a picnic pavilion, walking and biking trails, sand volleyball court and a large playground area. Freedom Park connects with Brundage Park on Carrell Road and is also surrounded by James Andrews County Park, creating a 1,000-acre green belt of parkland. Group picnics and special events are held in the park year-round. The main attraction at this active recreation area is a beautiful beach which includes a beach house with a changing room, a refreshment stand, picnic facilities for small and large groups, permanent docks for lap swimming, a spray park and a basketball court. 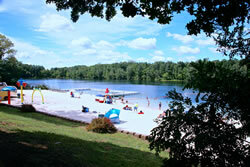 The public beach is open for daily visitation for a fee of $5.00 per person for residents and $10.00 for non-residents. On weekends and holidays, the non-resident rate is not available. Seasonal beach memberships are available for resident and non-resident families and individuals. Group rates are available for large groups. A separate picnic area can be set up by special arrangement. 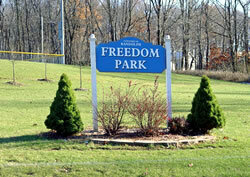 In addition to the lake, the park has a baseball field used for Senior and Junior Babe Ruth baseball. This active recreation area includes six soccer fields and four Little League/softball fields used by both children and adults, a large picnic pavilion, restrooms and a refreshment stand. A lake area encircled by the township’s bike trail provides a great setting for fishing and picnicking in warm weather months and ice skating in the winter. Used as a day camp site from June through August. The site is divided by Park Avenue which creates east and west sections. The western portion includes a large field used by many of our youth recreation programs. The eastern portion is the day camp area and includes a swimming pool, small tot-lot and various buildings for camp activities. The camp section of the park is closed to the general public because the township leases this area to a private operator. A custom creative playground for children featuring free-standing swings (infant, belt tire), slides, climbers, activity panels & overheads and picnic tables and benches. A neighborhood park with a small playground and play area that can be used for picnics. A monument dedicated in memory of veterans of foreign wars is located here. This is the site of the township’s VFW building where special teen events and activities are held. Facilities include a 1/2 court basketball court, picnic area and benches. On a beautiful site overlooking the Millbrook Valley. Features rolling hills, a pond and natural walking trails. The township’s walking and biking trail traverses the site. It is anticipated this park will remain a passive recreation area used for Boy and Girl Scout camping. This is an 111-acre undeveloped area. The township’s 16-mile trail system cuts through the park and connects to Brundage and Freedom Park. Comprised of 167 and 84 acres of magnificent forest and open space. The township’s trail system traverses the properties. Trail heads are located on Combs Hollow, Old Brookside and Dolly Bridge roads.